Total Athletic Therapy: Study Spotlight: Does Texting While Walking Influence Your Gait? 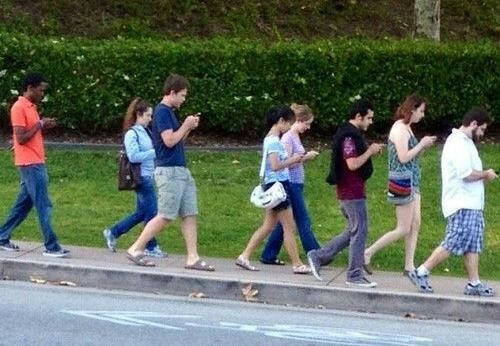 Study Spotlight: Does Texting While Walking Influence Your Gait? More and more people are partaking in the annoying habit of texting or facebooking while walking down the sidewalk, clumsily not looking where they are going, obliviously strolling their way into traffic. I wish I could blame teenagers for this ridiculous behavior but I myself have also committed this mobile device infraction. But can phones disrupt our gait patterns and influence our ability to make decisions? Researchers recently attempted to find out. Researchers had 30 participants complete 3 different trials: 1) Normal walking, 2) Texting and Walking, 3) Texting and walking whilst being cognitively distracted via a standard math problem and negotiating an obstacle course. During the walking trials, researchers monitored the gait characteristics of each person using a 3D Motion Analysis System. Researchers found that people took longer to complete the course while texting (~5 sec) and during cognitive distraction (~5 sec) compared to normal walking. No differences were noted for barrier contacts during the obstacle course however step frequency, step time, lateral deviation and double leg support time increased during the texting and distraction trial. 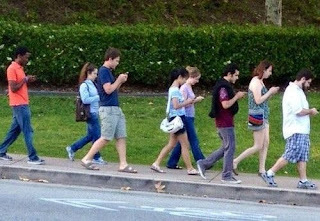 The authors concluded that texting while walking and/or being cognitively distracted significantly influenced gait characteristics which is similar to the phenomena of being on your phone and walking city sidewalks. Altogether this appeared to result in a more cautious gait pattern, which is good from a safety standpoint but not a time-efficient way to travel. So keep your head on a swivel! And please, stop riding your bike with no-hands while texting and listening to musics, that's just stupid. Licence, S., Smith, R., McGuigan, MP., Earnest, CP. Gait Pattern Alterations during Walking, Texting and Walking and Texting during Cognitively Distractive Tasks while Negotiating Common Pedestrian Obstacles. PLoS One. 2015, 10(7).